This new double CD, from the awardwinning Celestial Harmonies label, is a world safari of amazing music. Dr Florian Messner, ethnomusicologist from SBS Radio, selected the 39 tracks from the vast Celestial Harmonies catalogue, recognised as the most authentic, adventurous and exotic selection of recordings available in the world today. Dr Messner also compiled the accompanying extensive 34page information booklet of scholarly notes. The sound journey includes some outstanding new compositions and recordings (previously unreleased) from musicians such as Australian percussionist Michael Askill, worldrenowned field recordist David Parsons, and leading Australian vocal ensemble, The Song Company. Some special pieces come from countries where music is never recorded or even heard outside their borders. Tarian Gong reflects the unity and soul of the people of Timor. David Parsons risked his familys life to record pieces such as Craen from The Music of Cambodia (19902) , and the aweinspiring Ezan from The Music of Islam (19907). Highly rhythmic pieces from the lively Spanish/American Mariachi Cobre, the West African acoustic/instrumental group Takadja and Daniel Binellis Tango (15020) explode between mystical and meditative sounds from the Monks of the Dip Tse Chok Ling Monastery, The Renaissance Players and Alan Dargin. Classical sounds such as the Czecho-Slovak Radio Symphony Orchestra playing Mascagni's Intermezzo, Nikolaus Lahusen playing Ciurlioniss piano composition and a breathtaking choral piece from the highlyacclaimed The Music of Armenia (19909) are also part of this eclectic journey. 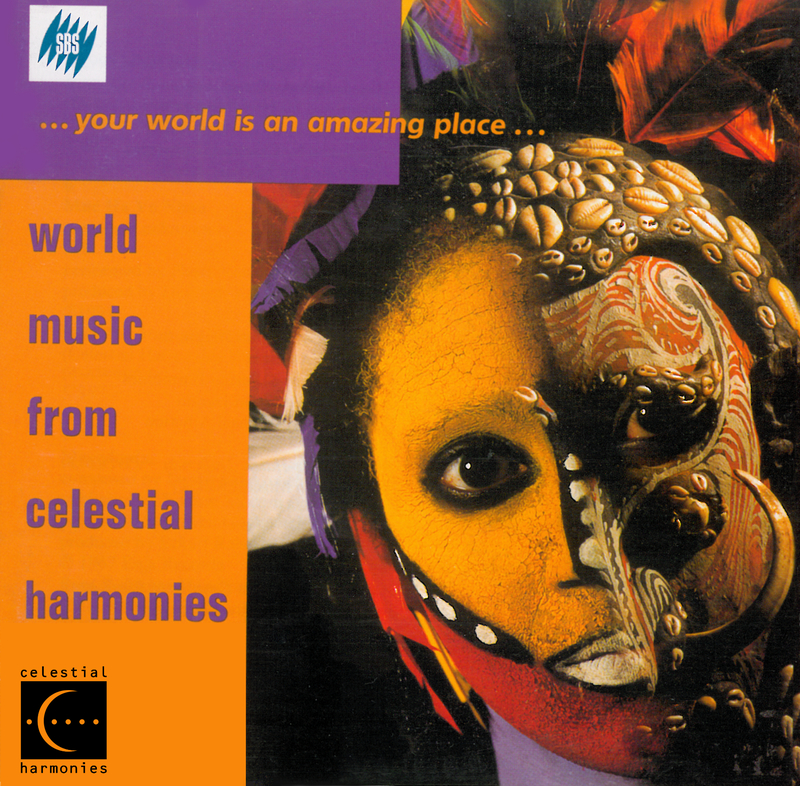 World Music from Celestial Harmonies will be available from record stores and Dymocks Australiawide from September 2002. 1 Om composed by David Parsons, performed by David Parsons & Dr. Ritwik Sanyal from Dancing to the Flute (13135) 7'56"
2 Omnia tempus habent (für gemischten Chor, Pauken und kleine Trommel) from Orff Schulwerk, Vol. 2: Musik für Kinder (13105) 2'22"
composed by Carl Orff, performed by Madrigalchor der Hochschule für Musik in München 2'31"
3 Gassenhauer (Street song) composed by Hans Neusiedler 1536, arranged and performed by Michael Askill previously unissued 4'46"
4 Crossings composed by Alan Dargin & Michael Atherton, performed by Michael Atherton from Cross-Hatch: Didjeridu+Percussion (15028) 3'40"
5 Intermezzo (from Cavalleria Rusticana) composed by Pietro Mascagni, from The Romantic Approach, Vol. 2 (13101) 3'40"
6 Muc Ha Vo Nha composer unknown, performed by Pham Van Ty from The Music of Vietnam, Vol. 1.2 (13083) 5'35"
7 Macedonia composed and performed by Dusko Goykovich from Swinging Macedonia (Enja 4048) 7'20"
8 The Prayers of Forgiveness (Sosol) traditional, performed by the Monks of from Sacred Ceremonies (17074) 5'29"
9 Andachtsjodler (für gemischten Chor a cappella) composed by Carl Orff, from Orff Schulwerk, Vol. 2: Musik für Kinder (13105) 2'01"
10 Fonikéya Marassi composed by Oumar N'Daiye, performed by Takadja from Takadja (13097) 4'28"
11 Trorpean Piey traditional, performed by the musicians of the Royal Court of Phnom Penh from The Music of Cambodia, Vol. 2: (13075) 3'39"
12 Callejon de las Viudas composed by Omar Sepulveda, performed by Inkuyo from The Double-Headed Serpent (13070) 4'15"
13 Rashdayl anonymous, performed by Various Artists from The Music of Islam, Vol. 7: Al-Andalus (13147) 4'07"
14 Craen traditional, performed by musicians of the Royal Court of Phnom Penh from The Music of Cambodia, Vol. 2: (13075) 1'58"
15 Prelude in D minor composed by M.K. Ciurlionis, performed by Nikolaus Lahusen from M.K. Ciurlionis, Complete Piano Music, Vol. 1 (13185) 1'43"
16 Ai Ina Mama (Oh, Mama) composer unknown, performed by the Lupu Group from Music of Timor (13182) 3'30"
17 Tarian Gong (Gong Dance) composer unknown, performed by musicians of Subulaku village from Music of Timor (13182) 3'14"
18 El Pastor composed by Cuatres Castilla, performed by Mariachi Cobre from Mariachi Cobre (11095) 3'14"
19 Peace Pipe Prayer to the North, South, East and West from Spirit of Fire (13079) 2'23"
1 Ezan (Call to Prayer) traditional, perfomed ny H. Hafiz Hüseyin Erek from The Music of Islam, Vol. 10 (13150) 1'52"
2 Metrópolis composed and performed by Daniel Binelli from Tango (15020) 3'29"
3 Chinar es (You are a plain tree) composer unknown, from The Music of Armenia, Vol. 2 (13116) 3'19"
4 Beyond the Sky composed by Brian Keane, from Beyond the Sky (13047) 4'41"
5 Carolan's Quarrel with the Landlady composed by Turlough O'Carolan, from The Music of Turlough O'Carolan (17005) 2'28"
6 A Los Que Se Fueron composed and performed by Daniel Binelli from Tango (15020) 3'39"
7 Al Fatiha composed and performed by Brian Keane and Omar Faruk Tekbilek from Beyond the Sky (13047) 3'19"
8 Vadam, et circuibo civatatem composed by Thomás Luis de Victoria, from Song of Songs (13199) 7'02"
9 Our Saint of Rosary composed and performed by Marcio Montarroyos from The New Feeling (13124) 4'23"
10 A Enrique el Mellizo composed by Rafael Jiménez and Antonio Fouró Morón, from Cante Gitano (13112) 3'02"
11 Virtuoso Didj composed and performed by Alan Dargin from Cross-Hatch: Didjeridu+Percussion (15028) 1'35"
12 Gögun Yedi Kati (Seven Gates of Heaven) from Süleyman the Magnificent (13023) 1'34"
13 Haralambis arranged by Winsome Evans, performed by The Renaissance Players from The Sephardic Experience, Vol. 2 (13167) 3'38"
14 Ana Atarajjak composed by Mohammed Atroush and Omar Nusair, from The Music of Islam, Vol 11 (13151) 6'40"
15 Homeward Prose traditional, performed by Liang Cheng-Gong from The Hugo Masters, Vol. 2 (13043) 4'02"
16 Sirt Im Sasani composed by Arakel Siunetso, arranged by Komitas, from The Music of Armenia, Vol. 1 (13115) 4'32"
17 Selemat Datang traditional, performed by Swara Cipta Priyanti from The Music of Bali, Vol. 1 (13136) 3'46"
18 Brotherhood composed and performed by David Hykes and Timothy Hill from Harmonic Meetings (14013) 11'57"